ALBANY – Dominic A. Coluccio, 81, of Albany, died Sunday, April 25, 2010 in the Hospice Inn at St. Peter’s Hospital. Mr. Coluccio was born November 30, 1928 in Locri, Reggio Calabria, Italy, the son of Joseph and Maria Greco Coluccio. He was employed as a school teacher in Italy until moving to the U.S. in 1951. He was employed by the Fuller Brush Co. as a foreman, and later was employed by the New York Lottery, a job which took him around the state. He was a communicant of St. Margaret Mary’s Church for many years. 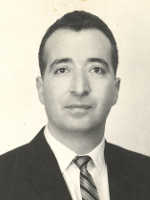 Mr. Coluccio is survived by his beloved wife Frances Farrugia Coluccio; his children Marie Coluccio, Loretta Ackerman, Joseph Coluccio (Susan), Frank Coluccio (Joy), Roseanne Coluccio, and Tina Connell (Robert); his grandchildren Hannah Ackerman, Christina, Sara, and Katherine Coluccio, Olivia Hager, Isabella and Robert Connell, and Terri Miller (Steven); his great granddaughter Jordan Miller; his stepsister Rosemery Cuzdey (Larry); his sister in law Mary Jane Ryan; and by many cousins, Godchildren, nieces and nephews. He was predeceased by his stepsister Albinia Primono, and his stepbrothers Frank Bolognino and James Bolognino. The family would like to extend special thanks to all of the fine doctors who treated Dominic during his many years of illness, and to the nurses and staff of the Hospice Inn for their fine care. Funeral services will be held in the Hans Funeral Home, 1088 Western Ave., Albany, Thursday morning at 8:45, and from there to All Saints Church (formerly St. Margaret Mary’s Church), Homestead St., Albany at 9:30. Relatives and friends are invited, and may call at the funeral home Wednesday from 4-8 p.m. Entombment will be in St. Agnes Cemetery, Menands. Those who wish may make memorial contributions to the Scleroderma Foundation, Attn: Donations, 300 Rosewood Drive, Suite 105, Danvers, MA 01923. To leave a message of condolence for the family, or obtain directions to the funeral home, please visit www.HansFuneralHome.com. I am very sorry to hear of the loss of your father. My thoughts and prayers are with you. Tina, Bob and family, you have our deepest sympathies at this time. May the God of heaven give you the peace and understanding we all seek during these difficult situations. Your friends are here to help and serve. May God bless you and ease your sorrow. The thoughts and prayers of my family go out to all of you in these difficult times. Our thoughts and prayers are with all of you at his time. Uncle Dom is at peace. I am very sorry to hear about Uncle Dominic. I know that you provided him with loving care throughout his illness. I hope that you find comfort in each other during this sad time. My thoughts and prayers are with you all. Tina, it is with heartfelt sadness we learned of the passing of your father. He will be in our prayers as well as your family. We were saddened to hear of the loss of your father. Please know you are in our thoughts as you deal with this difficult time for your family. Papa was loved, and always will be.